Also serving communities of Scotia. There are 24 Assisted Living Facilities in the Schenectady area, with 5 in Schenectady and 19 nearby. To help you with your search, browse the 168 reviews below for assisted living facilities in Schenectady. On average, consumers rate assisted living in Schenectady 4.6 out of 5 stars. Better rated regions include East Greenbush with an average rating of 5.0 out of 5 stars. Caring.com has helped thousands of families find high-quality senior care. To speak with one of our Family Advisors about assisted living options and costs in Schenectady, call (855) 863-8283. Known as the city that "lights and hauls the world,” Schenectady, New York has a population of about 65,000, with about 23 percent in the 55 and over demographic. There are 23 assisted living facilities (ALFs) to serve the senior community, 18 of which are in nearby areas such as Niskayuna, Scotia, Latham, Slingerlands and Albany. The New York Department of Health is the regulatory agency for each of these facilities. Like most other areas of New York, Schenectady has a Sperling’s Comfort Index that's lower than the national average. Schenectady gets an average of 57 inches of snow per year, whereas the average for the country is 26 inches, so winters are sometimes tough. Rainfall is typical compared to the national average (40 inches versus 39 inches). Annual temperatures range between 14 degrees Fahrenheit and 82 degrees Fahrenheit. The average rank for air quality in the United States is 58 out of 100, based on the National Air Toxics Assessment. Schenectady’s rank is slightly higher at 63, which means air quality in the city is worse than average. This could affect seniors with respiratory illnesses. The overall cost of living index in Schenectady lower than the national average. However, grocery costs are significantly higher on average, which could make it hard to find affordable options. Seniors should pay serious attention to Schenectady’s crime rate, as the area isn’t as safe as other options. The area's violent crime rate is 82.7 out of 100, while the property crime rate is 60.7. These rates are much higher than the national averages of 31.1 and 38.1, respectively. ALFs that can demonstrate additional physical and asset protections might offer the best options. A historic district, Schenectady has a range of attractions of entertainments for seniors and loved ones, including Proctors Theatre, Schenectady Light Opera Company and the Schenectady Green Market. Individuals also can visit Bowtie Cinemas, the Dudley Observatory and the Empire State Aerosciences Museum. Schenectady is home to world-class medical facilities, including Ellis Hospital, in the event of medical emergencies or illness. Assisted Living costs in Schenectady start around $0 per month on average, while the nationwide average cost of assisted living is $4,000 per month, according to the latest figures from Genworth’s Cost of Care Survey. It’s important to note that assisted living rates in Schenectady and the surrounding suburbs can vary widely based on factors such as location, the level of care needed, apartment size and the types of amenities offered at each community. 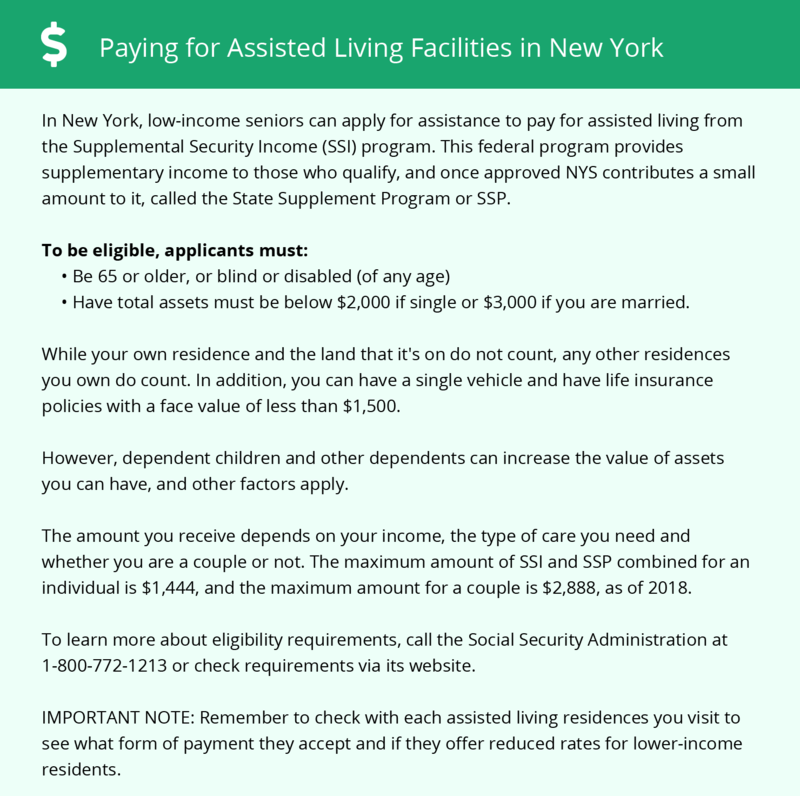 The Assisted Living Program, a state supplement for SSI recipients and the Long-Term Home Health Program 1915(c) Waiver program all can help seniors finance their ALF services. Schenectady and the surrounding area are home to numerous government agencies and non-profit organizations offering help for seniors searching for or currently residing in an assisted living community. These organizations can also provide assistance in a number of other eldercare services such as geriatric care management, elder law advice, estate planning, finding home care and health and wellness programs. To see a list of free assisted living resources in Schenectady, please visit our Assisted Living in New York page. Schenectady-area assisted living communities must adhere to the comprehensive set of state laws and regulations that all assisted living communities in New York are required to follow. Visit our Assisted Living in New York page for more information about these laws.